Yeah, I hate 'em. But I don't wear 'em, so...if the kids like 'em? Hell, play every game in them if they help the team win. I don't hate the neon green when they've used it on basketball unis. But this just looks like they accidentally bumped up the font size of the "STATE" to double what it was supposed to be then forgot to fix it. Also, why neon lettering but a white number? It just looks unfinished. It looks like an unlicensed product to me. But, whatever... Maybe if I hadn't spent my entire life becoming conditioned by looking at the history of football uniforms, I'd like this better than the traditional look. 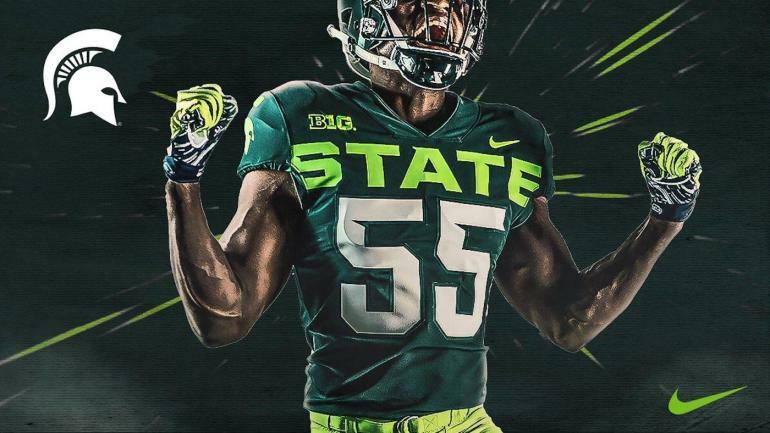 I'm just optimistic for another great football season under Coach D. If this uniform becomes part of the legacy of another Spartan run at the college football playoff, I'll be OK with it. I would like to know what the under-20 crowd thinks of them, but we don't really have that here. Wait, how old is JAR-Tan?